Awtho hantle waw haes steyed, mony biggin projects uised a puckle o the stanes. Hadrian's waw (Inglis: Hadrian's wall) is a lang stane an timmer waw made by the Roman Empire during the ring o Hadrian. It is fund on the northren mairch o the auld Roman kintra o Britainie. The waw wis stairtit in 122 AD, an maist fowk believe it wis made ti be the rinnen between auld independent Scotland an Brittanie. Forby, the mairch wis weirt an the economie mair siccar. Anither waw, the Antonine waw, is fund in Scotland, but haesna been hantle uphauden like Hadrian's. 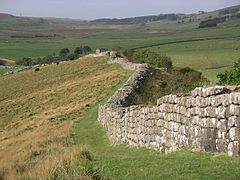 Wikimedia Commons haes media relatit tae Hadrian's Wall. This page wis last eeditit on 10 Mairch 2018, at 23:18.